The main objective of a basic mechanics course should be to develop in the engineering student the ability to analyze a given problem in a simple and logical manner and to apply to its solution a few fundamental and well-understood principles. 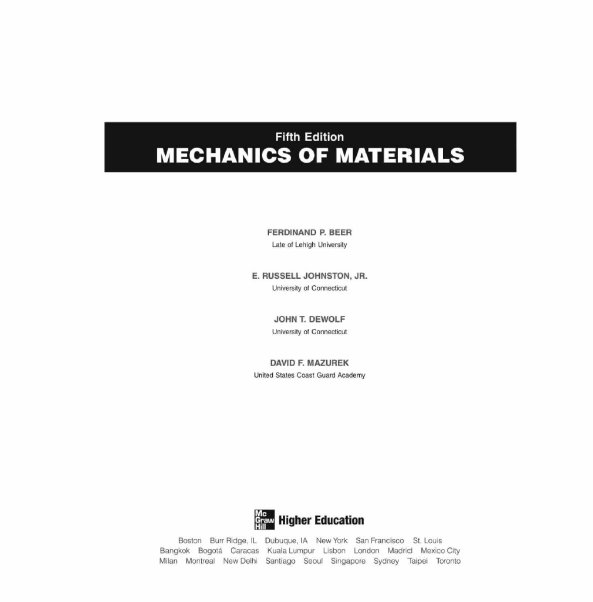 This text is designed for the first course in mechanics of materials—or strength of materials—offered to engineering students in the sophomore or junior year. The authors hope dial it will help instructors achieve this goal in that particular course in the same way that meir other texts may have helped them in statics and dynamics. members, and failure criteria, have been included in optional sections for use in courses of varying emphases. To preserve the integrity of the subject, these topics are presented in the proper sequence, wherever they logically belong. Thus, even when not covered in die course, diey are highly visible and can be easily referred to by the students if needed in a later course or in engineering practice. For convenience all optional sections have been indicated by asterisks. 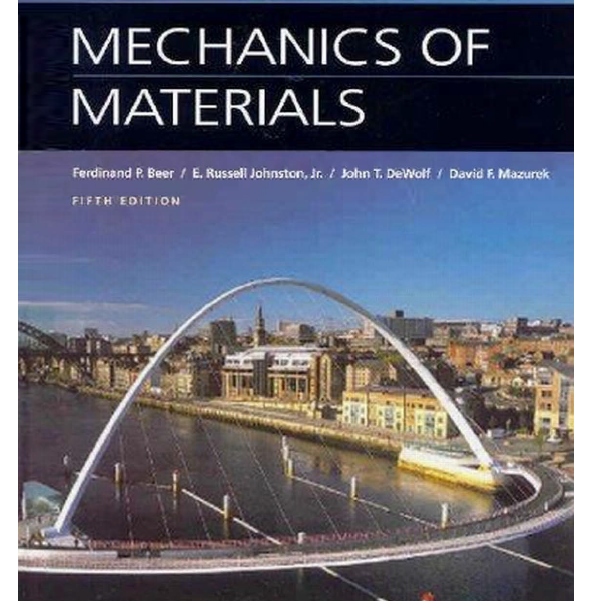 It is expected that students using this text will have completed a course in statics. However. Chap. 1 is designed to provide them with an opportunity to review the concepts learned in that course, while shear and bending-momenl diagrams are covered in detail in Sees. 5.2 and 5.3. The properties of moments and centroids of areas are described in Appendix A; this material can be used to reinforce the discussion of the determination of normal and shearing stresses in beams (Chaps. 4. 5. and 6). cases of torsion and pure bending. However, the discussion of computational techniques—such as Mohr's circle—used for the transformation of stress at a point is delayed until Chap. 7, after students have had the opportunity to solve problems involving a combination of the basic loadings and have discovered for themselves the need for such techniques. The discussion in Chap. 2 of the relation between stress and strain in various materials includes fiber-reinforced composite materials. (Sees. 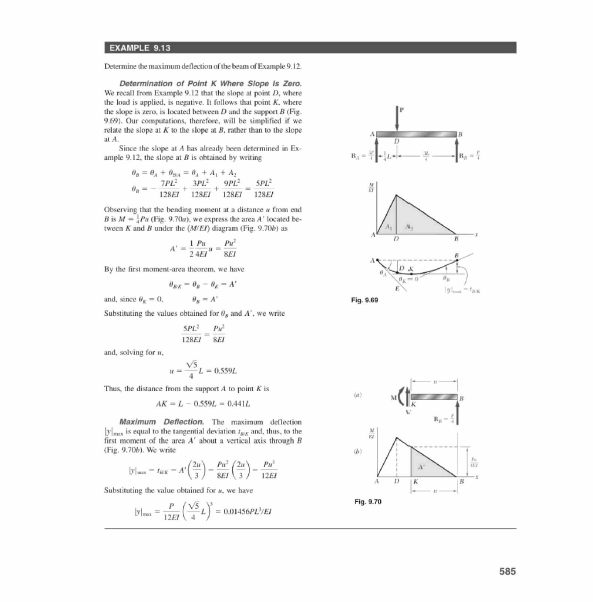 5.2 and 5.3) and includes an optional section on the use of singularity functions for the determination of the shear and bending moment in a beam (Sec. 5.5). 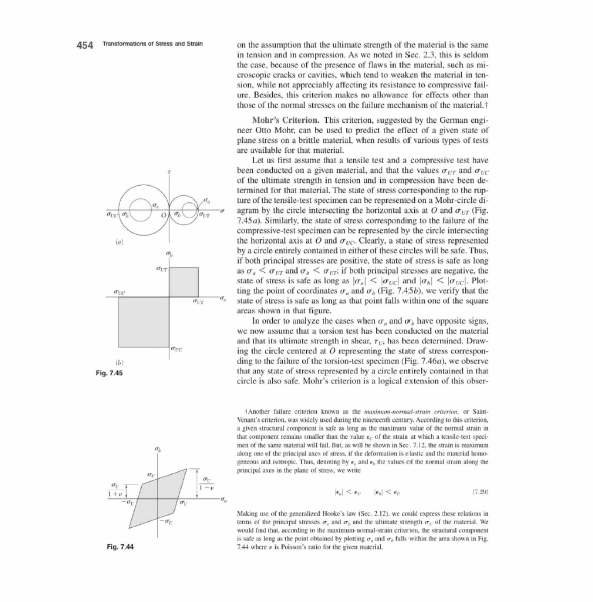 The chapter ends with an optional section on nonprismatic beams (Sec. 5.6). Chapter 6 is devoted to the determination of shearing stresses in beams and thin-walled members under transverse loadings. The formula for the shear How, q = VQ/I, is derived in the traditional way. More advanced aspects of the design of beams, such as the determination of the principal stresses at the junction of the flange and web of a W-heam, are in Chap. 8, an optional chapter that may be covered after the transformations of stresses have been discussed in Chap. 7. The design of transmission shafts is in that chapter for the same reason, as well as the determination of stresses under combined loadings that can now include the determination of the principal stresses, principal planes, and maximum shearing stress at a given point. Statically indeterminate problems are first discussed in Chap. 2 and considered throughout the text for the various loading conditions encountered. Thus, students are presented at an early stage with a method of solution that combines the analysis of deformations with the conventional analysis of forces used in statics. In this way. they will have become thoroughly familial" with this fundamental method by the end of the course. In addition, this approach helps the students realize that stresses themselves are statically indeterminate and can be computed only by considering the corresponding distribution of strains. The concept of plastic deformation is introduced in Chap. 2. where it is applied to the analysis of members under axial loading. Problems involving the plastic deformation of circular shafts and of prismatic beams are also considered in optional sections of Chaps. 3, 4. and 6. While some of this material can be omitted at the choice of the instructor, its inclusion in the body of the text will help students realize the limitations of the assumption of a linear stress-strain relation and serve to caution them against the inappropriate use of the elastic torsion and flexure formulas. The determination of the deflection of beams is discussed in Chap. 9. The first part of the chapter is devoted to the integration method and to the method of superposition, with an optional section (Sec. 9.6) based on the use of singularity functions. (This section should be used only if Sec. 5.5 was covered earlier.) The second part of Chap. 9 is optional. It presents the moment-area method in two lessons. Chapter 10 is devoted to columns and contains material on the design of steel, aluminum, and wood columns. Chapter 11 covers energy methods, including Castigliano's theorem. of a simple structure consisting of pin-connected members. Section 1.3 will introduce you to die concept of stress in a member of a structure, and you will be shown how that stress can be determined from the farce in the member. After a short discussion of engineering analysis and design , you will consider successively the normal stresses in a member under axial loading , the shearing stresses caused by the application of equal and opposite transverse forces , and the bearing stresses created by bolts and pins in the members they connect . These various concepts will be applied in Sec. 1.8 to the determination of the stresses in the members of the simple structure considered earlier in Sec. 1.2. The first part of the chapter ends with a description of die method you should use in the solution of an assigned problem and with a discussion of the numerical accuracy appropriate in engineering calculations. of safety in the computation of the allowable load for a structural component made of that material. a member, it is thus necessary to analyze die deformations that lake place in thai member. 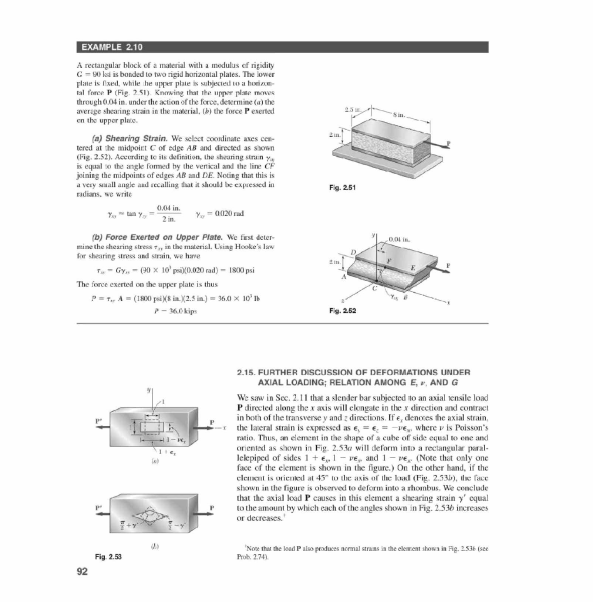 In this chapter, you will consider the deformations of a structural member such as a rod, bar, or plate under axial loading. In the two preceding chapters you studied how to calculate the stresses and strains in structural members subjected to axial loads, that is, to forces directed along the axis of the member. 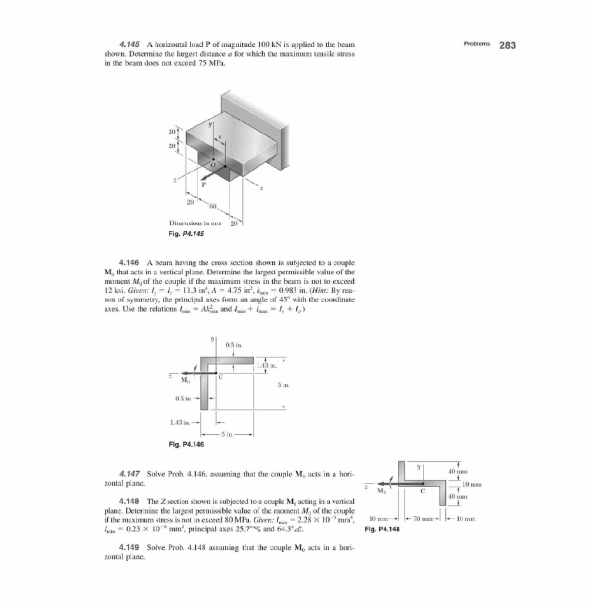 In this chapter structural members and machine parts that are in torsion will be considered. More specifically, you will analyze the stresses and strains in members of circular cross section subjected to twisting couples, or torques, T and T'. These couples have a common magnitude 7, and opposite senses. They are vector quantities and can be represented either by curved arrows. or by couple vectors. In the preceding chapter we learned to design beams lor strength. In this chapter we will be concerned with another aspect in the design of beams, namely, the determination of the deflection. Of particular interest is the determination of the maximum deflection of a beam under a given loading, since the design specifications of a beam will generally include a maximum allowable value for its deflection. Also of interest is that a knowledge of the deflections is required to analyze indeterminate beams. These are beams in which the number of reactions at the supports exceeds the number of equilibrium equations available to determine these unknowns. In the preceding chapters, we had two primary concerns: (I) the strength of the structure, i.e., its ability to support a specified load without experiencing excessive stress: (2) the ability of the structure to support a specified load without undergoing unacceptable deformations. In this chapter, our concern will be with Ihe stability of the structure, i.e., with its ability to support a given load without experiencing a sudden change in its configuration. Our discussion will relate chiefly to columns, i.e., to the analysis and design of vertical prismatic members supporting axial loads.